From retractable cabana roofs with wind sensor technology, to good old fashioned beach umbrellas, outdoor seating and cushions, and more, Marks & Tavano Workroom helps designers celebrate the great outdoors and the great outdoor fabrics offered by the world’s top textile houses. 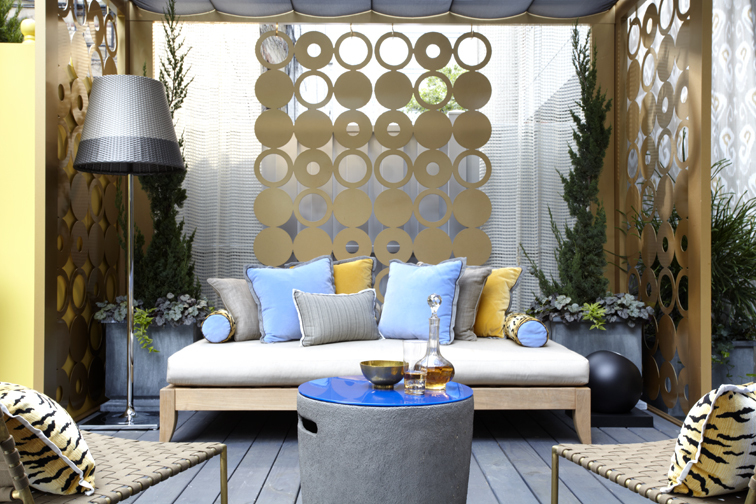 At the ELLE Decor Modern Life Concept House NYC, outdoor cushions in linen and velvets, outdoor draperies and a retractable cabana shade. Fabrics by Perennials and Kravet. Cabana by Designlush. Plantings by Erbology. Design by Michael Tavano Design. Photo: Rick Lew.